Arizona storms produce some pretty spectacular lightning shows. They're fun to watch if you're at a safe distance, but if you're out in th elements, dodging bolts can be downright terrifying...and life-threatening. Writer Scott Thybony knows that. 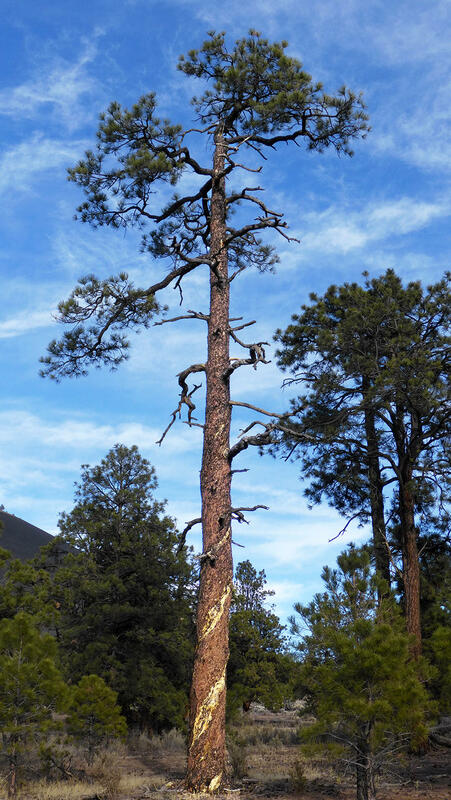 In his latest Canyon Commentary, he introduces us to Ahab's Tree, a lightning-scarred Ponderosa on the San Francisco Peaks. 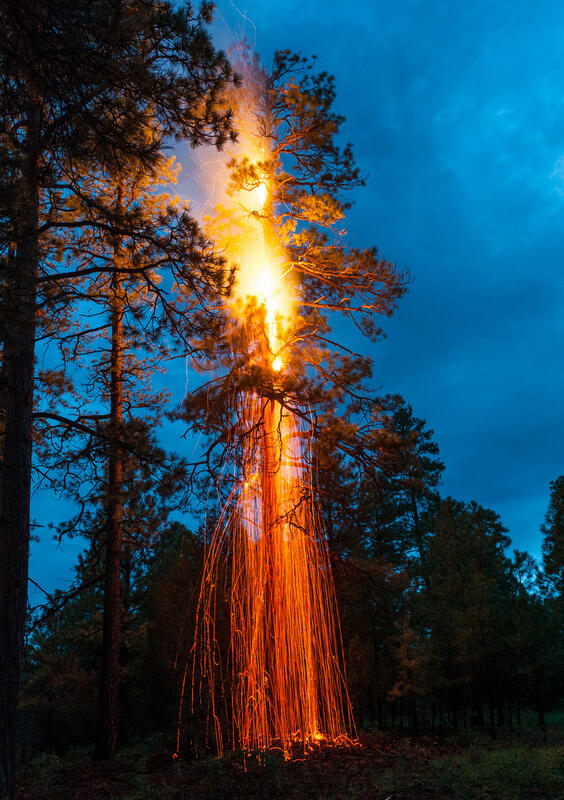 A scar runs straight down a towering ponderosa pine where a lightning bolt flash-boiled the sap and ripped away a strip of outer bark. I’m kneeling at the foot of a tree in the cinderfields below the San Francisco Peaks, following the discharge path into the ground. It provides visible evidence of the tremendous power generated in churning thunderheads and released in a flash lasting only a split second. 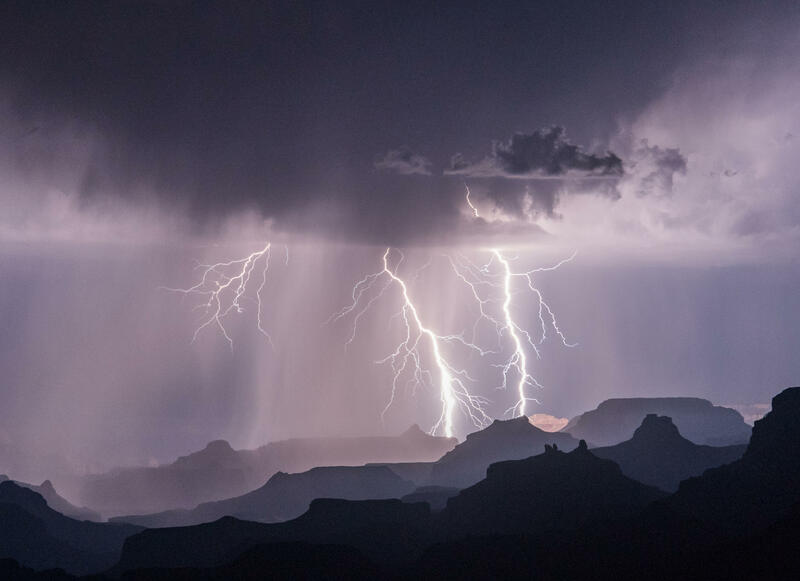 Lightning detection networks have recorded an average of 600,000 cloud-to-ground strikes each year in Arizona. The exposed mountain summits and craters surrounding me catch plenty of them, but many trees in the cinderfields below also show lightning damage. Realizing I would have nowhere to hide if a thunderstorm hit brings to mind an incident from the mountains of Colorado. We took a narrow-gauge railway into the San Juans and got off at a whistle stop. Strapping on our backpacks we headed into the high country, planning to summit three peaks over 14,000-feet high in a single day. That night we camped above treeline, and the following morning reached the top of the first mountain. I noticed the air had an electric charge to it, prickling the fine hairs on my face as if I’d brushed into a cobweb. But it soon subsided. With storms approaching from different directions, we estimated having enough time to grab one more peak. Our calculation ended up being slightly off. One hundred feet below the second summit, a flash of lightning exploded above us in a deafening blast. We instantly retreated as lightning hit again, then again. Totally exposed to whatever the storm threw at us, our group had no choice but descend to a lower basin and wait for it to pass. Completely unprotected, we spread out and crouched down as strike after strike hit the alpine expanse around us. Without appearing to follow any pattern, the force of the storm had a randomness to it which added to the uncertainty. No matter how much experience, no matter how physically fit, no matter how kindly you treat little kids and dogs, your chance of getting hit was the same as the person next to you. An overwhelming sense of being powerless came from getting caught in the open high above treeline. And you learn fast, I’ve found, when lightning strikes close. Scott Thybony is a Flagstaff-based writer.  His Canyon Commentaries are produced by KNAU, Arizona Public Radio.